Kameelah Janan Rasheed, Scoring the Stacks, 2019. Installation view, Brooklyn Public Library. Photo: Gregg Richards. 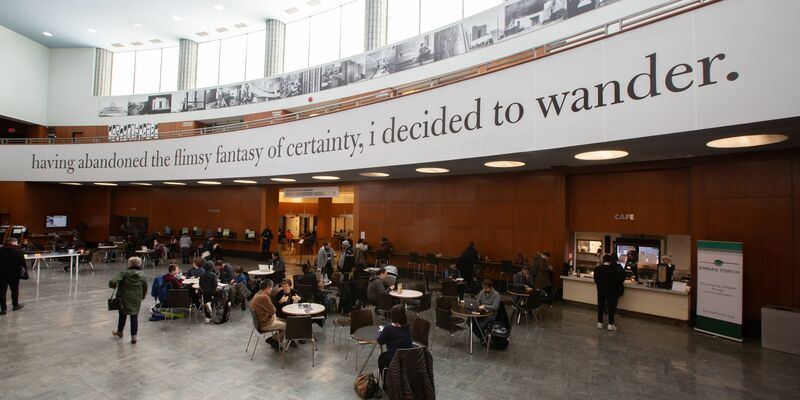 As the 2019 Katowitz Radin artist-in-residence at the Brooklyn Public Library, Kameelah Janan Rasheed has orchestrated Scoring the Stacks, a four-month-long project that fosters new dynamics between the library’s visitors and its books, between the roles of teacher and student, and between our notions of artist and artwork. Six accompanying public events invited participants to explore different ways to create, collaborate, and learn. Scoring the Stacks is on view at the library’s central location until April 7, 2019; Rasheed’s final event, This is Not an Artist Talk, will be held on April 4, 2019. Her work can also be seen in the New York group shows “Revolution from Without . . .” at the 8th Floor until May 4, 2019 and “Something to Say” at the Brooklyn Museum until June 30, 2019. IN THE PAST YEAR OR SO, I’ve stopped seeing myself primarily as an artist. I’m more of a learner who is trying to make her research and inquiries visible through an ecosystem of different media or experiments. I want to give myself space to learn and unlearn, and to provide opportunities for others to do so as well. I used to be a high school teacher and currently work in curricular development, so I’ve spent a lot of time thinking about how to create situations where learning isn’t just about achievement, getting things done, but instead emphasizes exploration, play, and serendipitous discovery. Given the pressure that many schools are under, exploration and play are often discouraged because they seem like “inefficient” modes of learning. Under capitalism, inefficiency is never framed positively—it’s considered wasteful. But I believe that learning is fundamentally inefficient, and that it shouldn’t be dictated by capitalist imperatives. Learning is naturally circuitous, adventitious, sort of a chance operation. I developed Scoring the Stacks with the Brooklyn Public Library’s curator Cora Fisher in order to encourage visitors to wander, to slow down, and to learn by discovery. We realized that we didn’t want to simply put artwork up in the space—it was too passive. It became crucial to use the library and to create opportunities for folks to encounter its resources in new ways. Not all members of society often get the chance to play. Because of poverty, racism, and other structures of extreme precarity, it often becomes more of a privilege than a right to play, to slow down, or to take a chance. For the duration of Scoring the Stacks, visitors entering the library encounter six stacks of cards on a long table. They contain performance instructions such as “Find a thin book. Turn to any page and write down two words that have more than six letters,” and “Find a blue book. Read the last page and write down a word you’d like to use in a future conversation.” The participant then writes down their discoveries on a piece of paper and drops it in a large box. Those residues of their experience, which we call the “scores,” become the raw material for our public programs. These programs were designed to foster collaboration, experimentation, and improvisation. In the first event, participants freewrote on paper scrolls the size of their bodies before producing a collaborative poem with Anaïs Duplan; in the second, we created and recorded a pop song with Morgan Bassichis. A few weeks later, we made our own dance choreographies with BrASS Burlesque. Each event used constrained writing techniques to incorporate words and phrases taken from these scores made by library visitors. All the documentation and resulting work from these programs will be on view at the concluding event for Scoring the Stacks on April 4. The names of all the participants and contributors will be emphasized. If you helped create a dance, you are an author of it. If you collaborated on the song, you are an author of it. I wanted to emphasize that the entire project hinges on these countless contributions.